Tuesday night was the Annual Meeting for Friends of the Conservatory, a nonprofit organization that provides volunteers and support for the Volunteer Park Conservatory. 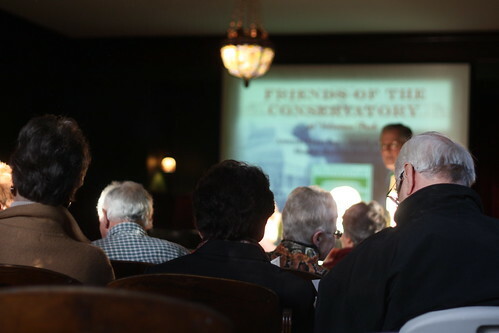 While going about the business of reporting on last year’s highlights and challenges and electing a new board, the presenters (Audrey Meade, the office manager and Anthonio Petit, the just-elected President) urged members to write to city officials to convey the significance of the Conservatory. It runs on a very lean budget: no one present could cite a firm number but $500k was suggested at one point by Petit. (update 4/29)We confirmed with Joelle Hammerstad of Parks that the Conservatory receives $463k annually from the city. The Volunteer Park Conservatory, a Seattle icon, the crown jewel of Seattle’s beautiful Volunteer Park, has been a refuge for young and old generations. The Conservatory, a favorite tourist destination, is just two years away from its 100th Anniversary. Though the Conservatory survived the Great Depression, this beloved landmark might not survive pending budget cuts to reduce the City’s $50 million budget shortfall. It seems inconceivable that the Conservatory could close, but insiders are very concerned. The budget, in draft form through this summer, will be finalized in September. Please let the Mayor, the City Council, and Parks know now how you feel about the possibility of the Conservatory closing. Whatever is decided, make your opinions count now. Put your taxpayer and voter views on the City’s radar. Attend one of two upcoming public hearings on April 28th and May 5th that will consider upcoming budget cuts. Cast 3 votes for “Keep Volunteer Park Conservatory Open” in the Mayor’s Ideas for Seattle suggestion box. Add comments. The Volunteer Park Conservatory is a special place because . . . It would be a great loss to Seattle if the Conservatory were to close because . . . Although budget cuts are inevitable, these are some reasons why the Conservatory should be spared . . . [Explain what the Conservatory means to you and why]. Why are we not all writing Bill Gates and Paul Allen. They have the money and clout in this town. The love the park people need to set up an endowment fund. The Conservatory is a treasure and need special attention and focus. $$$$ in a fund will help a lot. Perhaps you have not visited? The Conservatory (Plant House) is special, and one of the most special things about it is that the Friends of the Conservatory have kept admission free. While it is probably a place of significance for those who grow exotic plants, it’s pretty wonderful for people like me who just sometimes need a peaceful, oxygen-charged pace to be away from it all. It’s especially nice in the rain. I can’t count the number of times I’ve just had to go wander the Conservatory when I couldn’t stand anyone or anything else. So, not only is it important to save the Conservatory, it is really important to keep admission free. They do have a box just inside the door where they’ll take donations. Maybe one way we can all help is to go stuff a donation in the box — whatever you can afford on a given day. Please also mention keeping it free in your communications to officials. The Conservatory is a beautiful space, especially on dreary winter days. It would be heartbreaking if it was shut down. First off, the second City Budget is actually on May 4th. Secondly, if we all follow even half of those links our voices will be heard. We can save the Conservatory! Yes we can!!! Voting in the Mayor’s Ideas for Seattle is a little tricky. You have to register; then vote. Some people thought they have voted when they hadn’t. It’s best to keep an eye on the number of votes you have left.